Aleksandra Bobrowska (b. 1988) born in Gdańsk, a graduate of the Chopin State School of Music in Warsaw (P.Skrzypek), Royal Northern College of Music in Manchester and Haute École de Musique de Genève. Bobrowska honed her skills at numerous master classes taught by such artists as Dmitri Alexeev, Boris Berman, Michael Beroff, Daniel Blumenthal, Nicolai Demidenko, Pascal Devoyon, Philippe Entremont, Nelson Goerner, Garry Graffman, Thomas Hecht, Klaus Hellwig, Elżbieta Stefańska, Krzysztof Jabłoński, Kevin Kenner, Heinz Medjimorec, David Moroz, John Perry, Andrzej Artykiewicz, Czesław Stańczyk, Ewa Pobłocka, Emilio del Rosario, and Lee Kum–Sing. 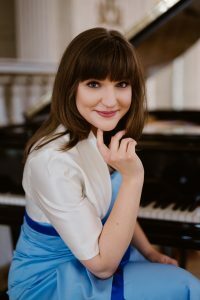 She performed in numerous venues in Poland (Royal Castle in Warsaw, Warsaw Philharmonic Hall), Austria, France, Germany, Luxembourg, Switzerland, Norway, Great Britain, Italy, Spain, USA, Japan, and Russia. She performs solo as well as a chamber musician.